Manchester City stretched their lead at the top of the table to 11 points and created Premier League history with a 14th successive victory this season as they overcame Manchester United at Old Trafford. Pep Guardiola’s side also ended United’s 40-match unbeaten run at home – which stretched back to their win here in September 2016 – to strike a potentially decisive blow against their closest rivals in the title race. City took the lead their vast superiority deserved when man-of-the-match David Silva hooked home from close range after confusion at a corner on 42 minutes, only for United to be handed a lifeline in first-half stoppage time when poor defending from Nicolas Otamendi and Fabian Delph allowed Marcus Rashford to steal in for a composed finish. Otamendi made amends nine minutes after the break when Romelu Lukaku – who had a nightmare game – lashed at a clearance in the area and the City defender pounced on the rebound to score. Everton captain Wayne Rooney equalised from the spot after Pawson ruled Dejan Lovren’s push on Dominic Calvert-Lewin was worthy of a penalty. Liverpool took the lead through Mohamed Salah’s sublime curling finish from an angle towards the end of the first half, which was deserved reward for the command shown by Klopp’s in-form side. Substitute Olivier Giroud glanced in a superb late header to salvage a point after the Gunners had trailed since the third minute. Charlie Austin clipped home an early opener for the home side with the away defence mere onlookers. The Southampton striker drilled a stinging shot into Petr Cech’s gloves shortly after, then hit the post from an offside position. Leicester claim a third straight Premier League win as Ayoze Perez’s own goal gives them victory at Newcastle. Heung-min Son and Harry Kane starred as Tottenham cruised to a 5-1 Premier League win over Stoke at Wembley on Saturday. Son helped give Spurs a first-half lead as the South Korean’s cross was deflected into Jack Butland’s net off of Ryan Shawcross, and Mauricio Pochettino’s side hit three goals in 13 minutes after the break to get some much-needed points on the board. Son gave Spurs a two-goal lead seven minutes after the break after finishing a Dele Alli through-ball, and Kane – who missed a gilt-edged chance in the first half – made amends with a header two minutes after Son’s effort. Kane then netted his second 10 minutes later with a coolly taken finish, and Christian Eriksen broke through a non-existent Stoke back line with 16 minutes left on the clock to add the fifth. The only mark against Spurs’ performance was Stoke’s soft consolation goal, with Shawcross heading home after Hugo Lloris came and failed to clear a routine corner. Swansea City hauled themselves off the bottom of the Premier League table as captain Wilfried Bony’s emphatic late finish gave them a precious win over West Brom to ease the pressure on head coach Paul Clement. The out-of-form sides seemed paralysed by tension in a first half almost entirely devoid of any meaningful action until the visitors’ Jake Livermore headed against his own post. Steve Mounie scores a first-half double as Huddersfield end a run of four consecutive defeats with victory over Brighton. Christian Benteke went against manager Roy Hodgson’s orders to take the injury-time penalty he missed in Crystal Palace’s 2-2 draw with Bournemouth. Cherries goalkeeper Asmir Begovic pushed away Benteke’s weak effort as a rollercoaster encounter ended with the points shared. The visitors had taken the lead when Jermain Defoe fired low into the bottom corner from Andrew Surman’s cross. But Palace roared back with two goals in three minutes. Luka Milivojevic, who initially lined up the injury-time spot-kick, buried a penalty awarded for a foul on Wilfried Zaha, before Scott Dann steered home Yohan Cabaye’s ball across the face of goal. Defoe’s second – a superb, dipping half-volley – sent the teams to the break even. Scott Arfield’s first-half goal takes Burnley within a point of the Champions League places as they defeat 10-man Watford. 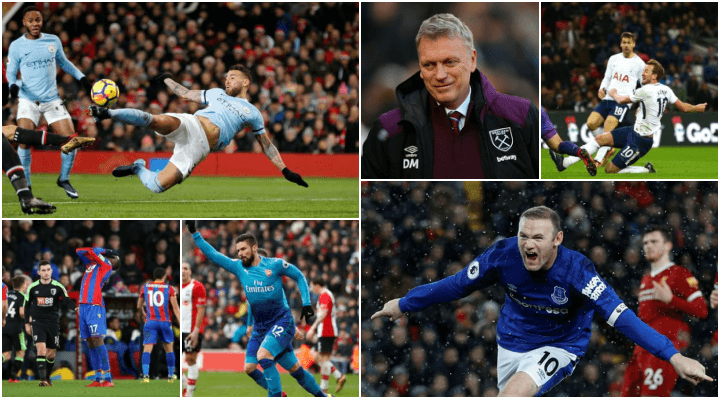 West Ham won for the first time under David Moyes as Marko Arnautovic’s first goal for the club proved enough to beat a disjointed Chelsea at London Stadium. The Hammers scored the only goal after just six minutes when Arnautovic curled a deft strike into the bottom corner after exchanging passes with Manuel Lanzini on the edge of the area. Chelsea responded well before the break but were repelled by an organised West Ham defence and two solid saves from Adrian, retaining his spot in place of the dropped Joe Hart.